Pictured from Hartland Service along with their staff are owners, Debbie and Mike Kusch. Also pictured are representatives from the Hartland Chamber. 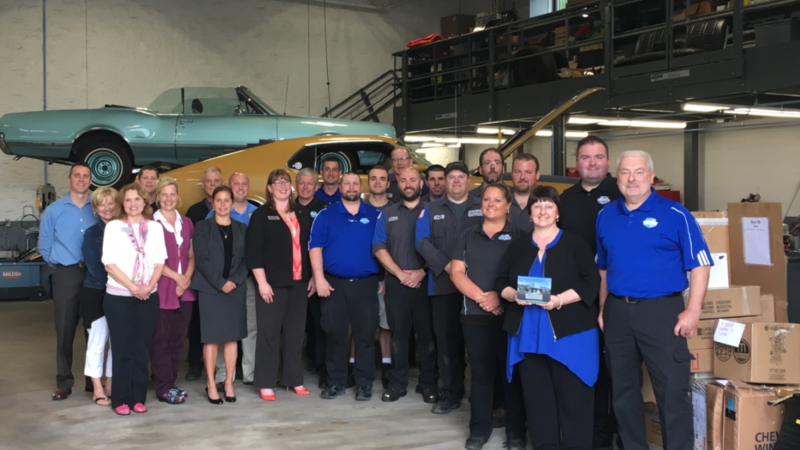 Hartland Service, Inc., 400 E. Industrial Drive was recently presented with the Golden Hammer Award by the Hartland Chamber of Commerce in recognition of exemplary property improvements. The Chamber believes that these improvements positively and directly affect commerce in Hartland and enhance the community as a whole. The intent of the Golden Hammer Award is to further encourage property owners and businesses to invest in improvements which ultimately make Hartland a better place to work and live. Hartland Service, Inc. located in Hartland, WI., since 1992, is a family owned state of art independent automotive repair facility that prides itself in being considered the preferred service center in their community and the surrounding area. Servicing vehicles is a family tradition and passion that traces its roots back to 1919 and with Mike and Debbie’s son Jeff joining the company in 2003 makes them four (4) generations strong! Their evolution as a family business started with Otto Kusch and his two brothers, Clem and John, working at the first shop in Milwaukee’s near north side fixing cars and shoeing horses! In 1945 the shop moved to a nearby Texaco gas station and for almost 50 years three generations of Kusch mechanics were fixing neighborhood cars. His son Jack took over the business in 1974 and Jack had his two sons, Mike and Mark as mechanics continuing the family tradition to today. In 1992, the shop moved to Hartland Wisconsin where Mike and Debbie opened Hartland Service, Inc.
Their shop has grown from 6 to 20 service bays with an expansion in 1997 and another in 2016. This was a re-investment to the future by expanding their operation from 10,870 square feet to 19,700 square feet. This investment, of over $2,000,000.00, expanded services to include a detail center, two new car washes, a touch-free and soft-cloth lane, free vacuum stations, a state approved emission test lane and a specialty vehicles shop, named “K4” to acknowledge Jeff Kusch, the 4th generation. This specialty shop provides varied services for the antique, collector, custom, muscle, street rods, as well as sports car enthusiasts – foreign and domestic. This dying art of auto knowledge and expertise is Mike’s passion, which fortunately is being passed on to Jeff. Hartland Auto Inc. takes pride in their technical and professional staff. They believe that re-investing in their employees, company infrastructure as well as being employee, customer and community focused, has developed a culture where customers love to come, employees enjoy being a team member, and Hartland Auto, Inc. is considered a valued member of the community to which varied contributions in time, commitment to community organizations, donations and talents have been given generously by Mike and Debbie. What makes Hartland Service, Inc. unique is they service all makes of vehicles, both domestic, foreign and now specialty vehicles. Hartland Service, Inc. is proud to be a certified hybrid service center trained to repair and maintain electric and hybrid cars that are growing in numbers. Electric charging stations are in process of being provided as the next service offering.